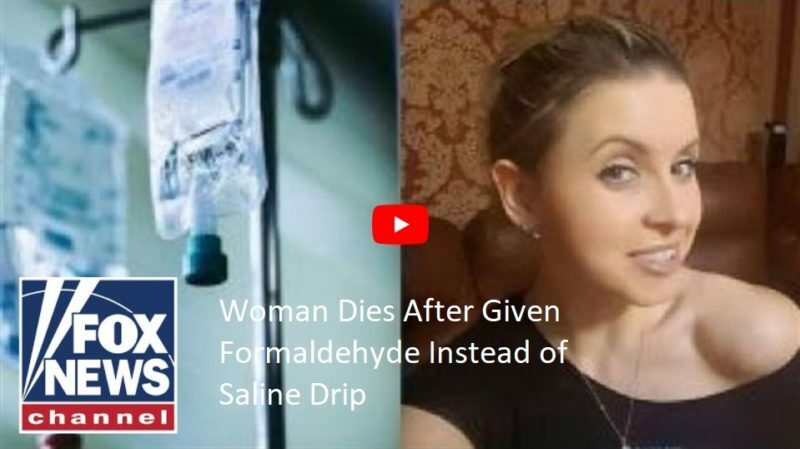 A 27-year-old Russian woman has died after doctors mistakenly filled her IV bag with a solution containing formaldehyde. Ekaterina Fedyaeva was said to be undergoing routine surgery at a hospital in Ulyanovsk, Russia when the hospital put her on a formalin drip, which contains formaldehyde and is used to prevent corpses from decomposing. Doctors had allegedly intended to put Fedyaeva on a saline solution drip. Fedyaeva suffered tremendously before falling into a coma as a result of the hospital’s mistake. 3 Responses to "Woman Dies After Given Formaldehyde Instead of Saline Drip"
It is truly amazing and that “they” look at everything except vaccines. “They” are concerned about formaldehyde in candles that are not ingested but not injecting it into humans, even infants. I just cannot understand that. It is really frustrating to know that we are being controlled like sheep. At least the shepherd is genuinely concerned about his sheep. Now, limonene itself isn’t particularly dangerous, but when it’s released into the air, it reacts with ozone to create formaldehyde — yes, the same formaldehyde used in embalming. Please get this story right before you publish it! Thank you for the clear up of what really happened. Either way though, medical incompetence. Now why don’t they get fired when those whom were given various vaccinations fall ill overnight?